A few months ago he was a high school football coach. Now Charlie Cristo is a cancer patient, battling not only an aggressive disease but also years of bitterness and disappointment. Then anonymous letters start arriving from a source known only as The Sender. Lift your spirits. Work the process. Help one another. The short, wise counsel in the letters challenged Charlie Cristo to fight the disease ravaging his body and the anger threatening his soul. 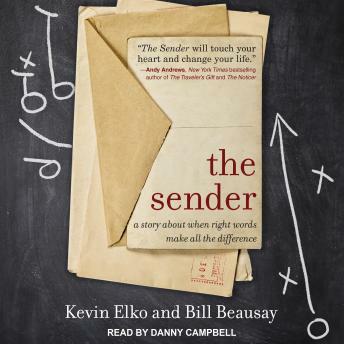 Based on actual letters sent to Indianapolis Colts head coach Chuck Pagano during his cancer treatment, The Sender blends creative storytelling and inspiration to communicate a powerful message of endurance and strength. As you journey along with Charlie, you will uncover profound lessons that challenge you (just as they did Coach Pagano) to live a life serving and loving others no mater what trials you endure.